The celebrity chef and fitness personality pushes his digital lifestyle magazine into print. It’s very exciting for me to see the magazine finally go to print. I personally selected each story featured in this special edition and look forward to taking readers on a journey and sharing the empowering message that is at the heart of Robert Irvine Magazine: Nothing is impossible. Celebrity chef and fitness personality Robert Irvine and American Media, LLC (AM), a leading publisher of celebrity and health and fitness brands, today unveiled the first-ever special edition print issue of Robert Irvine Magazine, available on newsstands on December 21. The 100-page special edition builds on the success of Irvine’s digital lifestyle magazine which debuted in May of 2016 and features all-new material in addition to some of Irvine’s favorite stories. 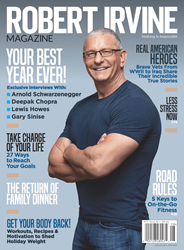 The first-ever issue of Robert Irvine Magazine includes celebrity interviews, recipes, fitness tips, inspirational stories, family advice, and more. The magazine is a partnership between Irvine and AM which will oversee advertising, marketing services and national distribution for the magazine. In the debut issue, readers will find in-depth interviews with the likes of Arnold Schwarzenegger and Gary Sinise, Robert’s favorite healthy recipes, workouts and fitness tips, and inspiring stories about military veterans and their families. The keepsake print edition is an ideal stocking stuffer for fans or collectors and will be available at major retailers and national newsstands on December 21st. Robert Irvine Magazine will continue with digital issues in January 2019. Robert also recently announced the launch of his fourth book, "Family Table By Robert Irvine," a collection of 72 family-style recipes and insights about how to create strong family bonds in the kitchen and at the table. "Family Table By Robert Irvine" is available for presale now at familytablebook.com and will be released in January. For more information about Robert Irvine Magazine, visit http://www.chefirvine.com/magazine. With more than 25 years in the culinary profession, Chef Robert Irvine has cooked his way through Europe, the Far East, the Caribbean and the Americas, in hotels and on the high seas. As the host of one of the Food Network’s highest rated shows, Restaurant: Impossible, Irvine saves struggling restaurants across America by assessing and overhauling the restaurant’s weakest spots. Irvine was previously the host of Food Network’s Dinner: Impossible and Worst Cooks in America, has authored two cookbooks, "Mission: Cook!" and "Impossible to Easy," and one healthy living book, "Fit Fuel: A Chef’s Guide to Eating Well and Living Your Best Life." Irvine is currently on tour with his new, interactive live show Robert Irvine Live, and appears regularly as an expert guest on national morning and daytime talk shows. In 2015, Irvine launched Robert Irvine Foods, a company that features a nutritionally improved line of food products without compromising great taste. Irvine recently established the eponymously named non-profit organization, The Robert Irvine Foundation, in an effort to support military personnel and their families. For more information on Chef Robert Irvine, visit http://www.ChefIrvine.com. American Media, LLC (AM) owns and operates the leading print and digital celebrity and active lifestyle media brands in the United States. AM's titles include Us Weekly, Star, OK!, In Touch, Life & Style, Closer, Men’s Journal, Muscle & Fitness, Mr. Olympia Contest, National Enquirer and other celebrity and teen titles. AM also manages eleven different digital sites including Usmagazine.com, OKmagazine.com, RadarOnline.com, Intouchweekly.com, Lifeandstylemag.com, Closerweekly.com, MensJournal.com, MuscleandFitness.com and other digital and social properties. AM's magazines have a combined total circulation of 5.7+ million and reach approximately 53 million men and women each month. AM's digital properties reach approximately 65 million unique visitors monthly.